So, your employer has proposed a settlement agreement . . . what next? If you’re happy with what you’re being offered, that’s great. Go ahead and accept it. But what if you want a bit more? Is there scope for negotiation? And if there is, how do you go about doing it? It can feel a bit daunting, so here are a few tips for nervous employees who want to negotiate the best possible settlement agreement. Before entering into settlement discussions with your employer, take a bit of time to prepare. Think about what you want to achieve and how you’re going to go about it. Here are a few things to think about in advance. Be an idealist for a moment! Think about what you’d really be happy with in this settlement agreement. What’s most important to you? What are the ‘nice-to-have’s? What’s the least that you’d settle for? Deciding your bottom limit is important as it ensures you’re not a pushover! What is high value to you that may be low value to your employer (and vice versa)? There are some things that may be really important to you that won’t cost your employer anything. An obvious example is a reference. A settlement agreement is a really good opportunity to negotiate a fantastic reference. You could even write it yourself and ask your employer to endorse it! It will really help you and won’t cost your employer a penny! Similarly, there may be some things that are crucial for your employer that you’re not too bothered about. For instance, employers usually like to keep termination payments confidential. As part of the settlement agreement, you can agree not to breathe a word about the deal to anyone. Most employees are happy with that. Which strategy should you adopt? 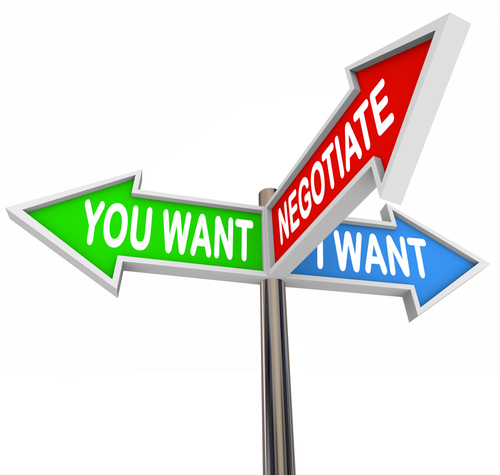 When negotiating a settlement agreement, there are two alternative strategies available to you. This may be sensible where your employer is offering you far less than you would be awarded in an employment tribunal. you are seriously considering legal proceedings. If you want to approach the negotiations in this way, you’re probably better off doing so through an employment solicitor who can put your case across strongly. Sometimes a gentler approach can yield better rewards. You may be better off asking for an improved settlement agreement without appealing to your legal entitlements. both parties are keen to preserve that relationship. You may be better off negotiating directly with your employer, rather than through a solicitor, if you’re appealing to their goodwill. Whichever approach you take, what is your employer’s incentive to improve the settlement agreement for you? This is one of the most important issues you should consider in the negotiation. If you’re taking the strict legal approach, consider why your employer should pay you more? What will you do if they don’t pay you more? In a settlement agreement, you’re giving up your right to bring any kind of claim against your employer. So what is the value of those rights? Has your employer breached employment law in a way that would entitle you to bring a claim? How likely is it that a claim would succeed? And how much money would you get if you were successful? A very rough guideline is to multiply the prospects of success by the amount you’d recover. For example if you’ve got a 70% chance of recovering £10,000, a settlement of £7,000 would seem reasonable. You may want to have a look at this blog to find out the types of payments you can expect. Employment law changed in 2013 to allow employers and employees to have ‘off the record’ settlement discussions. This kind of meeting is known as a protected conversation. You may find it helpful to let your employer know that you would like a protected conversation. This signals a willingness to be reasonable and is likely to oil the wheels of negotiation. You may find it helpful to read the ACAS Code of Practice on Settlement Agreements, which contains some useful information about protected conversations. A good negotiator will put themselves into the shoes of the other party. Instead of launching into an argument, ask a few questions to find out what your employer really wants to achieve. What are their priorities? For example, if your employer has proposed a termination date of the 30th November and you’d prefer to finish sooner, ask why they want you to finish on that date. What are the factors that prevent them you from finishing sooner? By approaching your employer in this way, you can work out what their motivations are and decide how best to approach the negotiation. Make sure you’ve understood your employer fully. Recap what they’ve said, so they know you’re listening and taking them seriously. Having done the preparation, thought it through and listened to your employer, you’re now ready to make an offer. Anchors are parameters that set the frame of reference for the rest of the conversation. Pick a figure that you want but is still sensible. If you ask for too much, you come across as naiive or unreasonable. But still make sure it’s your best offer. Silence can be a great weapon in any negotiation. Don’t over-explain what you want. By remaining quiet, you come across as much more confident. Listen to how your employer responds. Is there room for maneuver? What are you willing to concede on for the sake of reaching a settlement? There are several advantages to reaching a settlement agreement, particularly if the alternative is employment tribunal proceedings. Take a look at this blog if you don’t believe me! Agree next steps . . .
It’s usually the job of the employer to draft the settlement agreement once terms have been agreed in principle but you may want to email your employer just to re-state what has been agreed. This can help avoid confusion at a later date.